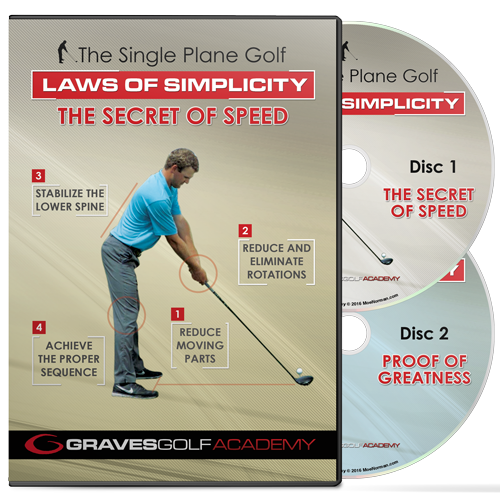 The Science of Simplicity: The Secret of Speed is my brand new DVD training. Inside, we focus on exactly that—creating more speed at impact—using the latest breakthroughs in body mechanics. You see, the Single Plane Swing is truly a biomechanical masterpiece. It’s simple…it’s easy…and it’s technically perfect. And through my research, I’ve uncovered the key elements… the hidden swing mechanics…that make the Single Plane Swing work so well for both beginners and scratch golfers alike. What Are the Laws of Simplicity? Reduce Movement: Less moving parts means less room for error. And to create more speed at impact, we have to first reduce the amount of moving parts in the swing. 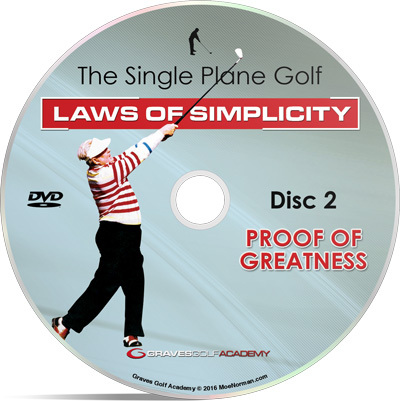 That’s why, in the Science of Simplicity, I’ll walk you step-by-step through the process of properly starting on a Single Plane, adjusting the spine angle for maximum results with minimal movement, and creating the optimal spacing between you and the ball. Reduce Rotation: While many of those younger guys on the tour can flex like rubber bands, most of us more “seasoned” fellas don’t have that ability. But in the Science of Simplicity, I’ll reveal how you can actually use this to your advantage, handing you the key positions for your trailing hand, trailing shoulder and lead knee to create less rotation and give you an easier to learn, more repeatable swing path. Increase Stability: Stress and pain on the lower back can turn every round into sheer agony. And the biggest cause of this is lack of stability in your swing. But in the Science of Simplicity, I’ll show you my never-fails method of better stabilizing your lower body using the muscles of your pelvic area, giving you a rock-solid platform to swing from and virtually eliminating those aches and pains. Sequence into Speed: Even the most technically perfect swings get out of whack every now and then (just ask Jordan Spieth, Tiger Woods, Phil Mickelson, etc.) That’s why, in this last section of the Science of Simplicity, focus on how to sequence all the elements of the swing to produce the ideal timing and the maximum speed into impact. THIS is how the little guys are bombing the ball every week. And this is what you’ll discover inside my DVD. Plus, after every training segment, I’ll give you some very specific drills to help ingrain these principles into your swing quickly, so you can see the results FAST (instead of spending hours and hours trying to dig them out of the dirt). …but you’ll simplify your golf game to a point where you don’t have to think about every shot—you’ll just step up and DO IT, knowing that every swing is on plane…on target…and on the money. Who is the Science of Simplicity for? Beginners: If you’re just getting into golf and looking for the fastest, easiest way to start hitting good shots on a regular basis, the Science of Simplicity is for you. We’ll break down the entire Single Plane Swing process and show you why it works so well. Then we’ll build it back up and put it all together again, creating an easy-to-follow roadmap for making a smooth, powerful swing every time. Intermediates: Playing for a while but can’t seem to get over the hump? Then the Science of Simplicity can help. I’ll show you why certain elements of your swing are actually causing you to play poorly, and how the Science of Simplicity can put you on the right track to more distance, more consistency, and lower scores. And the best part? You don’t have to spend another $500 on a new driver! Advanced: Single digit handicapper who’s ready to your game to the next level? The Science of Simplicity will give you that last little push, helping you to smooth out the creases and create maximum speed at impact and the consistency you desire. This is where the men are separated from the boys on the PGA Tour, and I’ll help you do the same on your home course. Mark recently uncovered some lost film footage of him and Moe on the range, just casually chatting about golf, life, swing mechanics, tournament memories and more. All the while, Moe is striping ball after ball with his steel shafted, persimmon head driver—straight as a string and barely wavering from the intended line. Plus, we’ll even take an EXTREMELY RARE look at Moe’s swing from an overhead vantage point. This is particularly astounding, since it’s something I had never seen before. You can really see the rotation of the body, shoulders, hips, and club movement. Everything that can easily get lost in a straight on or down-the-line view is instantly revealed in this never-seen-before overhead footage. All this, plus Moe’s special style of bunker play and much more, and it’s yours today for FREE with your Science of Simplicity order.